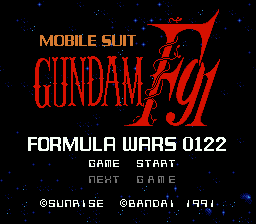 Mobile Suit Gundam F91: Formula Wars 0122 (F91) was released in Japan on July 6, 1991 for the Super Famicom. 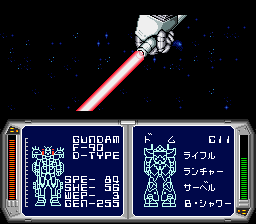 This game tells the story of what happened after the end of the manga Mobile Suit Gundam F90 and the beginning of the anime film Mobile Suit Gundam F91. There was also a manga released that chronicles the same story, although I'm unsure at present if the manga was released before, after or alongside the game; my Japanese is really rusty. The game itself is billed as a Real Time Strategy game, but don't go into the game expecting something similar to an RTS from the early 90s or you'll probably be sorely disappointed. 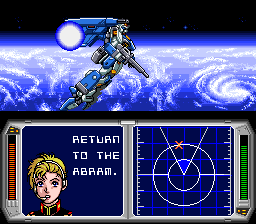 Sure, there's a map and you move the Gundam around like an RTS, but once you enter combat with an enemy unit everything RTS-like goes out the window. 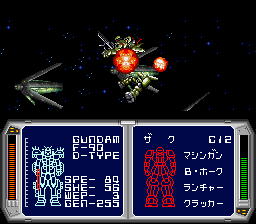 I've yet to see another game that has a battle system that's like F91's, which attempts to simulate the feeling of actually being in the cockpit of the Gundam you're piloting. 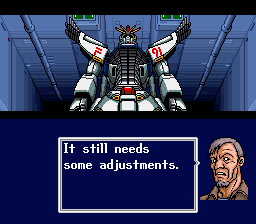 Whether it truly recreates the feeling of controlling a 15 meter high death machine or not (it doesn't, spoiler alert), it is a noble attempt, which I have to give Bandai credit for. 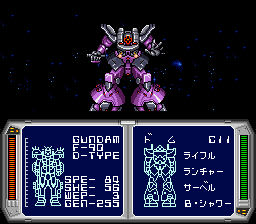 Overall it's a great game for a Gundam fan. We've tried to maintain consistency with the established canon where possible while making the story fun to read. Hope it shows. 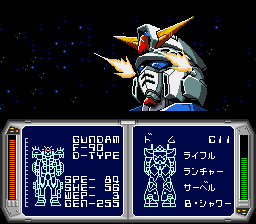 If you can't tell by my online handle, I'm a huge Gundam fan, especially the Universal Century stuff. 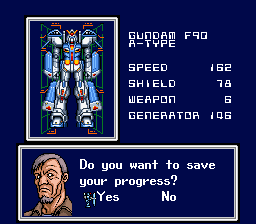 So naturally I was interested in hacking the Gundam games like V Gundam and F91 that are set in that universe. 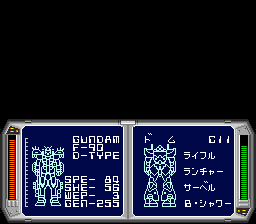 I first looked into F91 back when I got into hacking and didn't make any progress on it because the font is compressed. So I focused on other things. Eventually I had sharpened my skills enough to tackle the game and figured out a way to crack the compression, so I decided to officially announce the project way back in April of 2006. I was a senior in high school when I announced it and my 5 year class reunion should be sometime this year. I feel old. Heh. Once I announced the project, it just sort of stalled for a few years while I waited for a translator to show up. Finally in January 2009, SteveMartin approached me about the game and translated the script in a matter of days. Then I sat on my hands for probably another year while I was distracted with other things in my life before finally sitting down to add a VWF and a few other hacks in 2010. Then there was a lot of time spent fixing bugs, formatting the script, working too much or just being lazy and unmotivated. 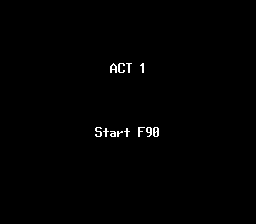 Finally after a lot of headaches everything came together and what you have is a patch that contains some of my best hacking work to date. The VWF code itself went through at least two complete rewrites and several optimizations. The end result is 100% bug-free code that runs quickly and smoothly. I'm extremely proud and happy with how everything in this project turned out. 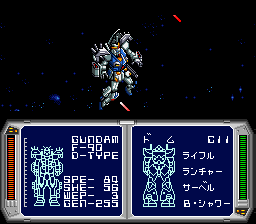 The antagonist of F91 is named (in romanized Japanese) "sharuru", which we've rendered as Charles in the translation. 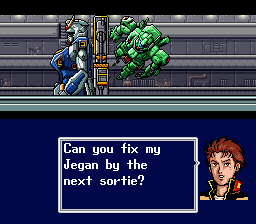 The reason for this (other than it's the commonly listed translation on the few English sites that cover this game) is because the pronunciation of the Japanese is almost identical to the French pronunciation of the name Charles. 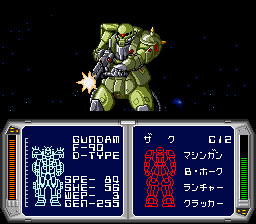 It's sort of like how Char Aznable's name is written as "shaa" in Japanese and rendered as Char in English. French class in high school wasn't a complete waste of time afterall. Go figure. 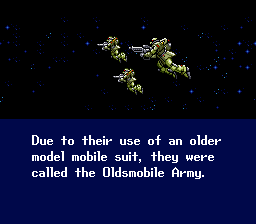 Before the credits roll, information about each mobile suit that appears in the game is displayed. 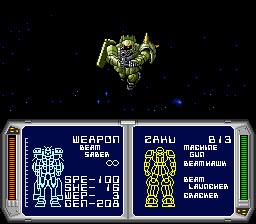 I've taken the liberty of fixing the few incorrect armament listings for some of the mobile suits to match the weapon names used in-game. All names have also been changed so that they are consistent with the accepted English canon (DENAN-ZON became DEN'AN ZON, etc). 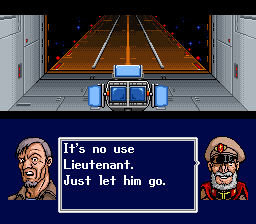 Lastly, all Engrish in the game that I know of has been located and rendered into (hopefully) coherent English. 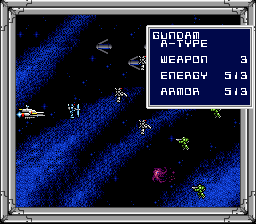 If you find any bugs please contact me (RedComet) via email at rpgcredcomet AT gmail DOT com or via PM on Romhacking.net. Alternatively, check the site for the most up-to-date contact information. 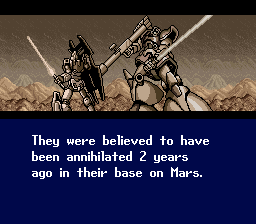 All the text in the game has been translated. 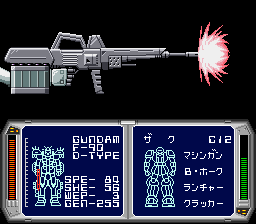 A VWF has been implemented for the story mode and a pseudo-VWF has been used for all of the weapon names that appear in battle. 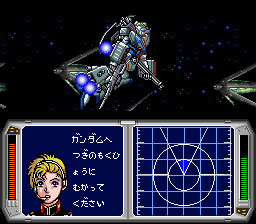 Additionally, all graphics were translated as needed. There are currently no known bugs in the patch. Please see the notes section above for more information reporting bugs. 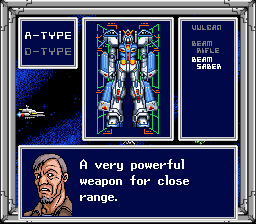 NOTE: This game should be played with bsnes or SNES9x. 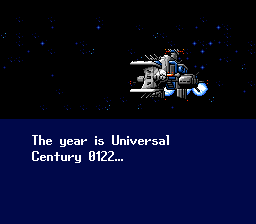 It is not compatible with ZSNES due to (presumably) emulation bugs in ZSNES itself. With a project that's gone on this long, there have inevitably been people who have aided in one way or another whom I've forgotten to mention. 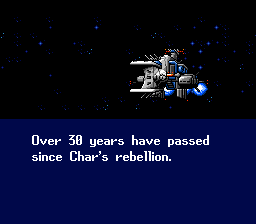 For those people and anyone interested in this patch or Twilight Translations, I offer a heartfelt THANK YOU for your continued interest and support.